It was a wet, a particularly wet, January Saturday afternoon in Bala. I had driven up to watch my team Cefn Druids take on the mighty Premier League Bala Town in the Welsh Cup (*), only to find when I arrived that the match had been cancelled. Hardly surprising I suppose given the thunder, rain and hail I had met with on the way. 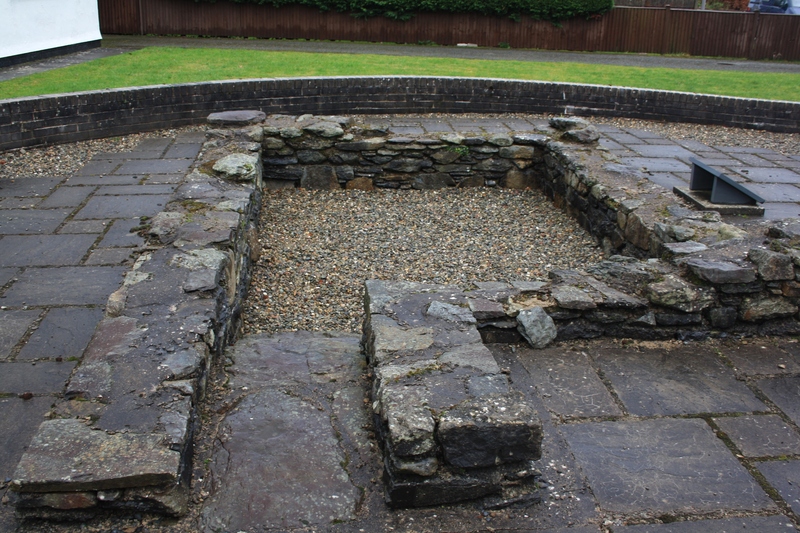 The one dry place in town was Beuno’s Well. The water no longer bubbles up here, replaced by stone flags and gravel, a victim of health and safety. Still, we are very lucky to have remains to see at all, and all due to the determination and dedication of various groups in the 1990s and early part of this century who saved the well from total destruction. I won’t go into details of Beuno’s life here. His mark is stamped heavily across North Wales and we have already given accounts of his wells at Gwyddelwen, Holywell and Clynnog. His specific connection with Bala is a little less clear; one just assumes he passed this way on his travels. To be precise, it is actually the Parish of Llanycil, a community a little further along the lake where the church, now deconsecrated, which was dedicated to Beuno. 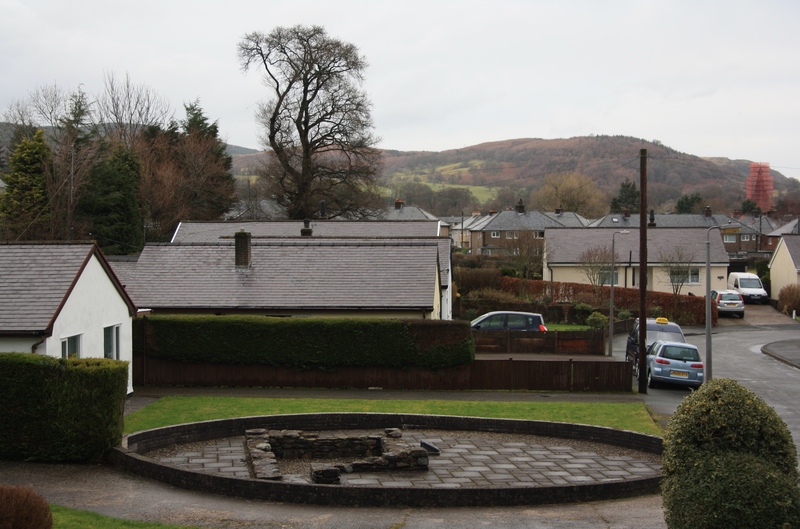 This historically was the parish in which Bala lay, so the well perhaps technically belongs to Llanycil despite having been subsumed by the urban sprawl of Bala. Beuno’s well here had a reputation as a healing well, being good for ligaments and bones, for eyes and for the liver, kidneys and bowels depending on whether you bathed in it or drank it. Its fame lasted into the Victorian era when Richard Lloyd Price of Rhiwlas, on whose estate it then lay, jumped into the burgeoning health spas market, bottling and selling St Beuno’s Table Waters, efficacious for the kidneys, and Rhiwlas Sparkling Water. A bottling plant was established briefly in the old Workhouse Building on the High Street. Covering all bases he also operated a nearby whisky distillery. 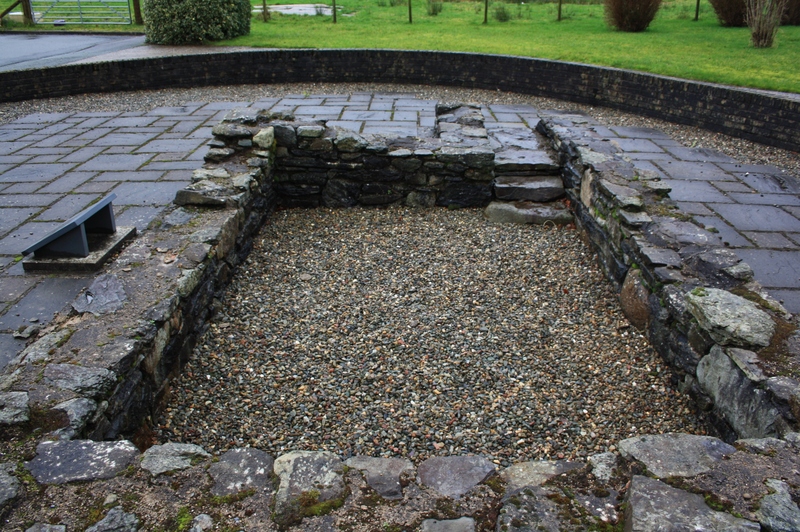 As the craze for table waters receded, the well fell further into disrepair. In the 1970s the land surrounding the well was sold to builders for housing development. but by luck some covenant prevented the owners including the land the well sat on in the sale. So thus it stayed, a little island in the midst of a housing estate. 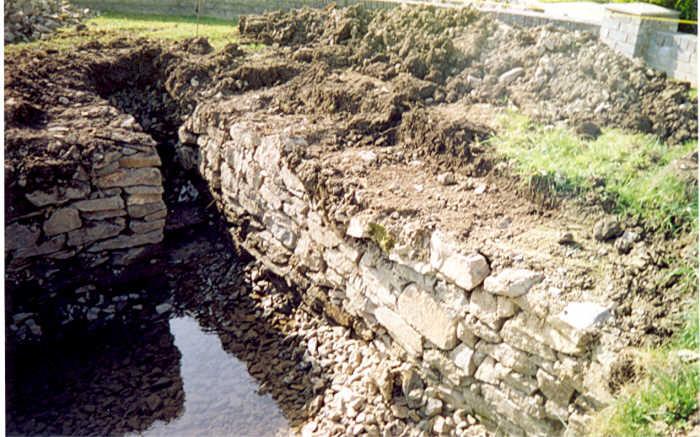 Although not actually built on, it filled up with builder’s rubble and covered over with spare earth from the works. Once excavated, the structure once again filled with water although it was impossible to tell whether this was from the spring still flowing or from the general level of the local water table. Plans to leave the well as found, however, had to be abandoned. The site was considered dangerous within the housing estate, earth from the building works was piled high against the edges of the well and there was no scope for water to flow out. Consequently the well was refilled and the structure seen today created. The walls are largely new construction on the top of the original structure, with two of the six steps retained to give an idea of what was once there. 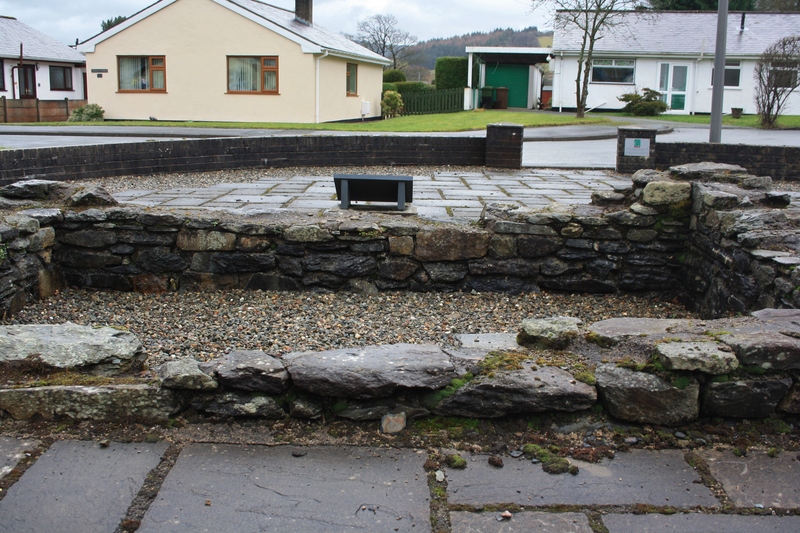 The whole is filled with gravel and surrounded with paving stones to minimise the need for maintenance. So we see here the shadow of a well, a representation and importantly a reminder of what was there; and this is a tribute to those organisations that protect, preserve and rescue these wells. 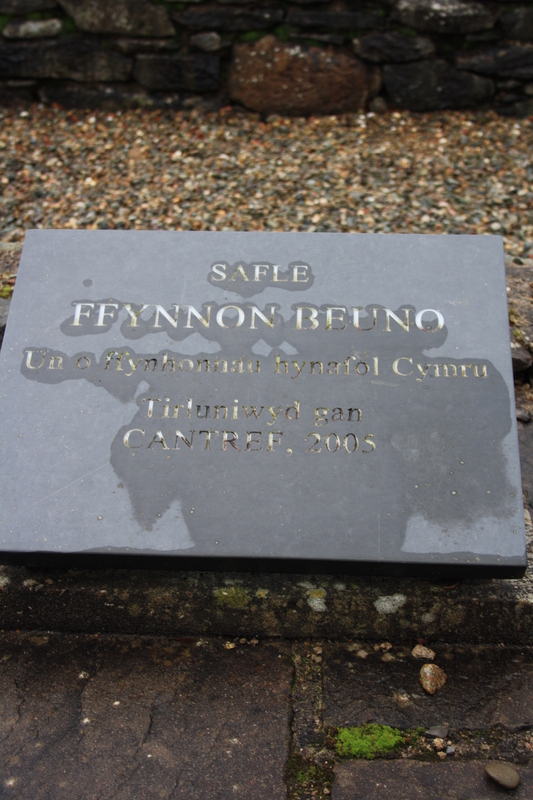 Had people not have stepped in, objected and campaigned when they did, then this site and almost all memories of Ffynnon Beuno at Bala would have been lost within a generation. (*) Written at a time when Bala were flying high in the Premier League and Druids were languishing in the Alliance. Great story. Good to hear about how such a site so clearly at risk, can be resurrected in some form and survives. Thankyou all for giving so much fascinating information on the well,it was a wonderful read.Good luck to your football team also,i will look out for there results.YNWA.LFC.